We get requests from media hosting companies which want their clients to have more control over the service functionality. That's why we make some steps forward. First one is to enable account admins to allow end-users to have full control over the servers. This is reasonable because a client may rent server at hosting company's server farm. So he wants to have full control over it. We got a section called Users management. It's located in Control top menu. This is a place where all account's users from all data slices are listed. For each user you can see it's name and email, user role (admin or user) default data slice name and number of assigned slice, and then links to actions - Edit, Delete and Abilities that allow enabling extra capabilities. You can also add new user by selecting its default slice, email for login and a password. A new user will be created with non-admin permissions so please do not select Full data slice for this user. You may change user details any time by clicking on Edit link. You will see a dialog like show below. Read more about WMSPanel streaming reporting for end-users. 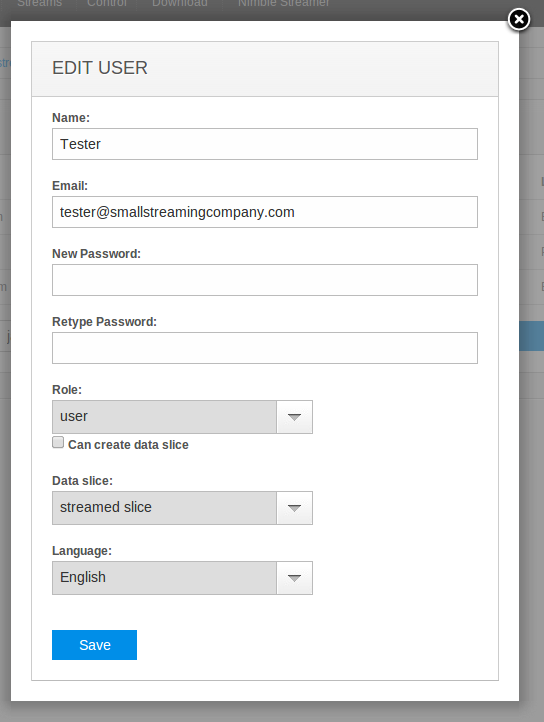 As you see from the screenshot above, an admin user may allow any specific non-admin user to create custom data slice. 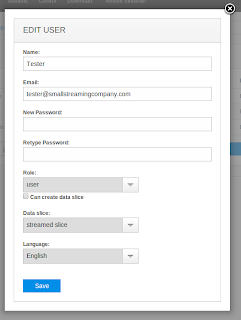 An admin just needs to edit user details and check the "Can create data slice" check box. This option is good for the companies which prefer giving their clients more flexibility and control over Wowza and its reporting. Another option for this kind of flexible companies is server control. A user may be allowed to see selected servers' internals and ability to control them. 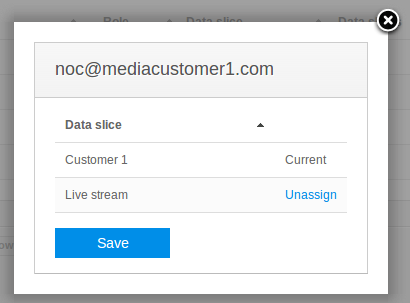 A user will be able to perform control of both Nimble Streamer and Wowza media server available in WMSPanel. For designated user, click on Abilities link to see the dialog shown below. Just choose which servers to allow your user to control and manage and then click Save. After that the end-user may choose Servers menu, then click on server name to find control capabilities. Each user has a name of the slice which he is assigned to and a number of data slices which he or she is assigned. Clicking on the data slice number link you will see the slices' list in a separate dialog. This dialog will allow following to each slice' details and un-assigning user from the slices. If you have any ideas for more end-user features, just let us know about it.